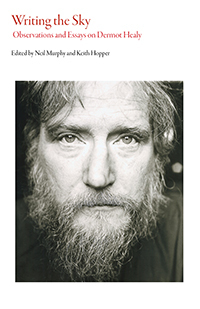 Writing the Sky: Observations and Essays on Dermot Healy is a comprehensive collection of critical essays, memoirs, poetry, and other writer responses devoted to the life and work of the late Dermot Healy (1947– 2014). Healy was an accomplished poet, short story writer, novelist, playwright, and editor, and so these essays and observations address the entire range of his eclectic and exciting oeuvre. While paying due tribute to the memory of the man himself, the collection primarily seeks to establish a series of important critical perspectives through which Healy’s writings can be properly viewed and assessed. Buy Book Here! Contemporary writers and poets— including Colm Tóibín, Neil Jordan, Aidan Higgins, Alannah Hopkin, Kevin Barry, Annie Proulx, Michael Longley, Roddy Doyle, Tess Gallagher, Timothy O’Grady, Glenn Patterson, Patrick McCabe, and many others—offer creative reflections on Healy’s work, while literary critics provide a wide-ranging foundation for future Healy scholarship. In total, over forty contributors from more than a dozen countries provide insight into one of Ireland’s most powerful and unique literary voices. This collection is absolutely crucial for everyone interested in the work of Dermot Healy and for all devotees of Irish literature. Bios: Neil Murphy teaches contemporary literature at NTU, Singapore. He is the author of Irish Fiction and Postmodern Doubt (2004) and editor of Aidan Higgins: The Fragility of Form (2010) and of the revised edition of Higgins’s Balcony of Europe (2010). He co-edited (with Keith Hopper) a special Flann O’Brien centenary issue of the Review of Contemporary Fiction (2011) and The Short Fiction of Flann O’Brien (2013). He has published numerous articles and book chapters on contemporary fiction, Irish writing, and theories of reading, and is currently completing a book on John Banville. Keith Hopper teaches Literature and Film Studies at Oxford University’s Department for Continuing Education, and is a Research Fellow in the Centre for Irish Studies at St Mary’s University, Twickenham. He is the author of Flann O’Brien: A Portrait of the Artist as a Young Post-Modernist (revised edition 2009), general editor of the twelve-volume Ireland into Film series (2001–7), and co-editor (with Neil Murphy and Ondřej Pilný) of a special “Neglected Irish Fiction” issue of Litteraria Pragensia (2013). He is a regular contributor to the Times Literary Supplement and is currently completing a book on the writer and filmmaker Neil Jordan.